How do I use the Ad Creative widget? Just add the Ad Creative widget to any current or new dashboard in which you want to show the your ad visuals. Report will automatically order and show your ads and selected metrics, based on the criteria you enter. What are some common ways to use the Ad Creative widget? 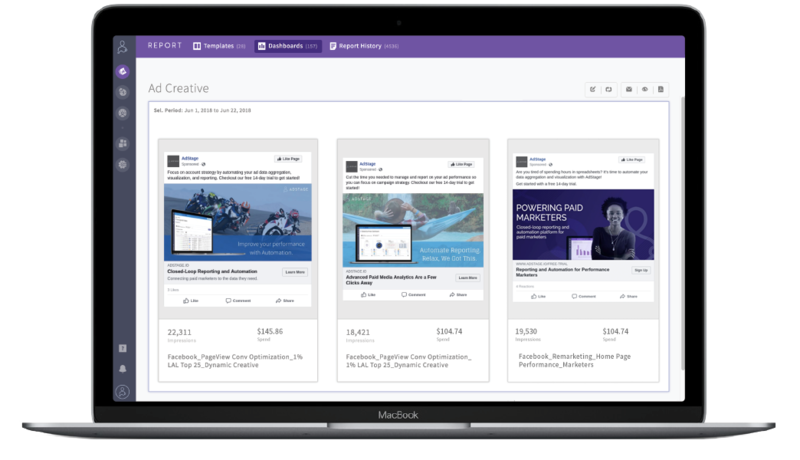 Show what converts: Display your top performing ads to show your clients or team members what copy and imagery results in the most conversions. Analyze campaigns: Review both high and low performing ad to discover any patterns in the visuals that might contribute to performance. Show value to clients: Demonstrate your creative and relevant ads, along with the performance of each. How do I set up an Ad Creative widget? Why do I get an error message that an ad type is not supported? Many times the ad types we support is dependent on the settings of the particular network. We're always looking to add ad types, please reach out to the support team about which ad type you'd like to be added next. For more information on what ad types are currently supported and how to exclude those that are not from your dashboards, please visit this support article. Have questions about getting started with the Ad Creative widget? Feel free to reach out to us at support@adstage.io.